Powerful presentations thatclose every deal!It's time to rethink your approach to PowerPoint (R) presentations. Rather than oversee data-filled informationsessions, you need to tell a compelling story that holds your audience's attention while selling yourideas. 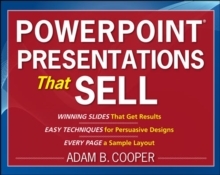 PowerPoint (R) Presentations That Sell helps business professionals efficiently structure presentations thataddress audience needs, while providing the necessary tools to create slide elements. With sample slideson every page, this unique guide explains how to:Format and organize slides to emphasize your main pointsSelect and create compelling charts using dataUse shortcut techniques to create slides fasterCreate a memorable, focused conclusionEnding with a case study displaying each presentation tip in action, PowerPoint (R) Presentations That Sellreplaces the same old features and benefits with actionable recommendations in a dynamic package guaranteedto get results.